Membership is free. To apply, you must complete our Membership Form, which is reviewed for approval by the FSRS Executive Committee. You must join as an individual, not as a company or group. Membership in the Society shall not be transferable: A membership ceases upon the resignation or death of a member, or by notice to the Society. A membership shall be revoked if the member ceases to qualify in accordance with the by-laws of the FSRS, or if a member’s conduct is deemed to be inappropriate or in conflict with the objects of the Society. Every member is entitled to attend any FSRS meeting, and to hold office in the Society. Every member of the Society shall be entitled to vote at any meeting of the Society except those members who are deemed to be in conflict of interest and/or are designated as non-voting. Members of the Society must abide by the Society’s Code of Ethics. Members of the Society shall not be remunerated for being members of the society or for carrying out routine and regular business of the Society, whether as a general member or as a Director. Members are not agents of the Society and accordingly can not enter into agreements, or make representation, on behalf of the society. You may apply directly on-line, or complete the application and mail or fax it to the FSRS. 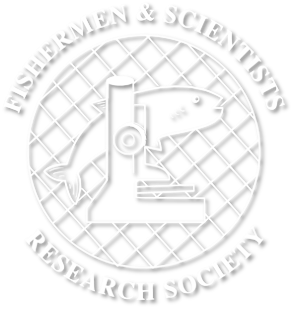 The purpose of the Fishermen and Scientists Research Society is to increase interaction, communication and cooperation between fishermen and scientists. The FSRS is not, and never will be, a lobby group. The FSRS will avoid, by action or inaction, any perception of bias in their representation of the interests of either the fishing industry or the scientific community. The Fishermen and Scientists Research Society (FSRS) is committed to protecting the confidentiality of the personal information of its members and stakeholders including, but not limited to, personal contact information. The FSRS shall not release personal information without the individual’s consent.